The University of Maine's Nolan Vesey controls the puck in front of the University of Connecticut's Corey Ronan during first-period action at Alfond Arena in Orono, Oct. 6, 2017. UMaine takes on Yale in Portland on Monday. 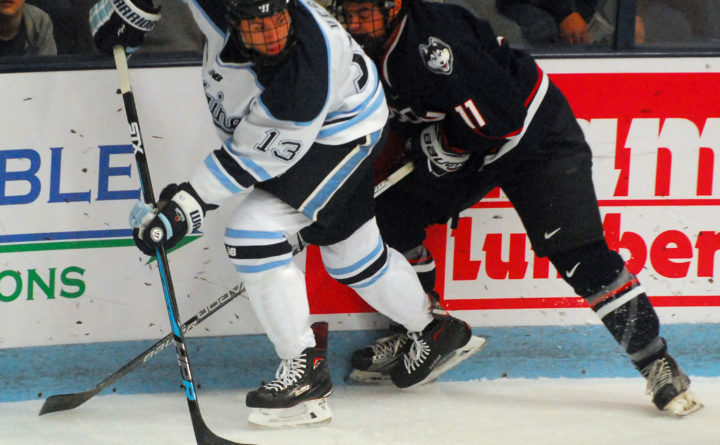 Game notes: Yale University’s Bulldogs will come into the game reeling after squandering a 4-0 lead in a 5-5 overtime tie at New Hampshire on Saturday night. Yale defensemen Jack St. Ivany and Phil Kemp earned a silver medal while playing for the United States in the World Junior Championships. The U.S. lost to Finland 3-2 in the gold medal game in Vancouver, British Columbia, on Saturday. UMaine is coming off a 4-2 win over Colorado College on Wednesday. It was just the third time this season UMaine has scored more than three goals in a game. Yale returned 12 of its top 13 point-getters and both goalies off last year’s 15-15-1 team. Snively was a 19-goal scorer a year ago and is currently seventh in the country in points per game (1.43) and 10th in goals per game (0.64). UMaine has done a much better job staying out of the penalty box lately, limiting opponents to 10 power-play chances over the last four games. That will be critical versus Yale, which boasts the nation’s ninth-best power play (24.5 percent). Yale is atop the ECAC standings along with Quinnipiac. UMaine head coach Red Gendron was Yale head coach Keith Allain’s assistant when Yale won its first and only NCAA title in 2013.